The color blue holds many meanings both positive and negative. In many faith traditions the color is symbolic of virtue, holiness, or of the divine. In some cultures blue represents academic or regal stature. In China blue represents immortality. On the other hand, in Germany employees are given “Blue Papers” instead of “Pink Slips” when being dismissed from employment. For Iran blue is the color of mourning. When one feels blue they are indicating a state of sadness. blue can be seen as cold, depressing, old-fashioned, or aloof. 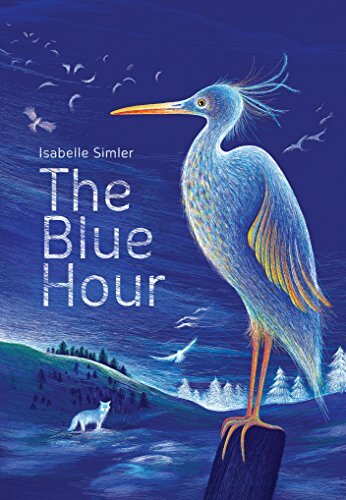 But in Isabelle Simler’s The Blue Hour the color blue is the epitome of calm and contemplative. From the first page Simler immediately introduces the reader to the time framed motivation for the story: “The day ends. The night falls. And in between . . . there is the blue hour.” She then enters into a journey through the natural world of blue-colored animals from various continents and eco-systems. Blue jays, blue poison dart frogs, silver-blue sardines, blue racer snakes, and a blue monkey are among the animals illustrated within a blue-dusk setting. The reader/viewer is treated to a few plants as well with a beautifully designed spread of forget-me-nots, bluebells, cornflowers, and violets that must smell wonderful as they play host to various insects. The animal illustrations are the true appeal. But as the book progresses, the pages, like the nighttime, get darker and darker. The result is that the illustrations toward the end (the Russian Blue cat, the whale, the moon) are plain and not as interesting. The story and the text are simple. During the blue hour all of the critters are settling in before fading into the dark of night when all will be peaceful, silent, calm. Words like motionless, quieting down, silently watching, becomes still, softly wraps, make one downright sleepy. A perfect book for naptime or bedtime. Unfortunately the story has its limits. All over the world, whether on land, sea or air, the dynamic is the same. There is a short window of time during which there is just enough light for the animals to make their final adjustments before hunkering down for the night. Dusk, on the contrary, is typically the time of day when there is a flurry of activity and nature actually becomes louder. It is a hard sell to claim that all is silent, quiet, and peaceful when in reality crickets are chirping, frogs are croaking, foxes are barking, owls are hooting, coyotes are baying, and a hubbub of other nocturnal animals are on the hunt all night long. It is a shame that this other side of the blue hour is simply overlooked here. Also, while the blue hour time frame explains the use of the color blue referred to in the title, there is little other purpose for the use of blue in the story. The inside front cover artwork is a grid-like palette of dots in the blue hue spectrum from pale blue to cerulean blue to slate blue and midnight blue. This first impression of the book leads one to presume there will be something further about these colors in the story. Granted, every animal has the word blue in its name, but this feels completely random and disjointed from the introductory palette. The back cover inside spread is a world map in black and midnight blue with white silhouetted animals placed on their respective home continents that, while informative, is a world away from the theme of the colors introduced in the front. The center pages don’t do enough to link the front cover color themes to the back cover ecology themes. The confusion is, then, what is this book really about? The color blue in general, as indicated by the opening artwork? A time of day known as the “blue hour,” as expressed in the first few words and the title? Animals with the word blue in their names or an exploration of blue in locations as diverse as the arctic and the jungle, as evidenced in the illustrations? Or calming down at the end of the day, as seen in the progressively darkening ambiance and cozy word choices? There is a little smidge of all of these things but not a coherent plot with any of them. There are almost as many personalities here as there are meanings ascribed to the color blue itself. One wishes there might have been a common thread that could have tied it all together to make this a super tight package instead of a showing of a handful of beautiful illustrations.